President Vladimir Putin has begun his Latin American tour by visiting Cuba, in an apparent bid to seek allies to counter US and Western influence. The Russian president’s choice of first stop, Cuba, is seen as an attempt to further boost friendly ties with the one-time Soviet ally. 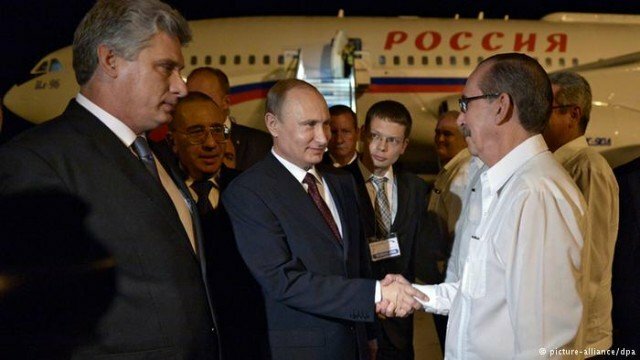 Russia confirmed cancellation of 90% of Cuba’s debt two days before the visit. Vladimir Putin will also travel to Argentina and Brazil, where he will attend the football World Cup final on Sunday as leader of the next host nation. Later he will attend a summit of the BRICS (Brazil, Russia, India, Chinas and South Africa) emerging economies in the Brazilian city of Fortaleza. In an interview on the eve of the trip, Vladimir Putin said Brazil was one of a group of emerging countries who should play a greater role on the world stage. “This powerful and fast-developing country is destined to play an important role in the emerging polycentric world order,” he said, adding that Russia would back Brazil’s bid for a permanent seat on the United Nations Security Council. Analysts say Vladimir Putin is trying to encourage Latin American countries to challenge Western dominance in the world at a time when Russia is isolated by sanctions over Ukraine and relations with the West are at their lowest since the Cold War. In Cuba, Vladimir Putin is expected to meet President Raul Castro and his predecessor and brother Fidel. They will be expected to discuss the progress of an agreement signed last year which cancels 90% of Cuba’s $35.2 million Soviet-era debt to Russia and channels the remaining 10% into joint investment projects in the country. The deal was ratified by the upper house of the Russian parliament on Wednesday. Relations between Cuba and Russia declined after the collapse of the Soviet Union in 1991 but have improved in recent years. Russia is involved in oil exploration offshore and began drilling a development well last year. Vladimir Putin said Russian companies were interested in investing in reinforced plastic products, car parts and heavy equipment for the railway industry.